There is evidence for continuous settlement from the Late Iron Age, throughout the Romano-British period and into the Early Saxon era. An iron age farm was recreated on the site by local archaeologists (thanks to Cambridgeshire Heritage Archaeology Service for this picture of an Iron Age Farm at dawn) but sadly this no longer remains. Excavations at Bob's Wood, in advance of house building to the west of the police laboratory, revealed some evidence of Late Neolithic activity (worked flint, pottery and a single pit) and a minor Bronze Age presence, including a pit with deliberately placed horse skull and associated pottery. Buried horse remains remains and beaker pottery together is still an extremely rare find in Britain. Discoveries of particular note amongst the Iron Age remains included roundhouses and other structures, evidence of metalworking, cremations, inhumations, placed deposits of currency bars and quern stones and significant assemblages of pottery and animal bone. The major findings relate to the extensive remains of a settlement dating from the Mid to Late Iron Age through to the Romano-British period. An agricultural community occupied the site for about 500-600 years from c.200BC to around 350-400AD. Findings from the Romano-British period included houses and associated structures, enclosures and water management features, a smithy, cremations, inhumations and significant assemblages of metalwork, pottery and animal bone. Imported ceramics including amphorae and samian ware were recovered. Looking slightly further afield, probably at least one villa was built on the Huntingdon side of the river. The Roman construction of Ermine Street, running north-west through the town, made this an important crossing point for the River Ouse, south to London and north to Lincoln and York. It is quite possible that the Romans built defensive earthworks to guard the northern side of the river above Godmanchester,where the castle mound now stands, although there is no archaeological evidence to prove this. The story of Hinchingbrooke itself begins in about the 6th century. Anglo-Saxons from what is now Denmark, Holland and north Germany occupied East Anglia following the collapse of the Roman Empire in around 400AD. The new settlers built new homesteads and farmed, having their own language and culture. The regions formed little kingdoms and the kingdom of the East Angles was one. The most famous relics from this period come from Sutton Hoo north of Ipswich. It's worth visiting the The Sutton Hoo Society and the National Trust website on Sutton Hoo where there is a rotatable model of the Anglo Saxon helmet. Inland areas such as Hinchingbrooke, on the edge of the Angles kingdom were populated later than sites like Sutton Hoo which had access by sea to Germany, Denmark and France.Therefore we expect Hyncel to arrive later in the period - say 600 AD. One man, called Hyncel, sets up house on a piece of rising ground near Alconbury Brook and the spot becomes known as HYNCELING BROC - meaning "the stream of the tribe / family of Hyncel". 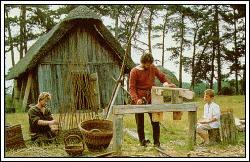 An Anglo-Saxon village was reconstructed in the grounds of Hinchingbrooke Country Park, though unfortunately it no longer exists. For more detail on this and other sites refer to the Cambridgeshire Historic Environment Record. Also Oxford Archaeology East. The first charter to refer to Huntingdon is dated 650AD, and mention is made in the Anglo-Saxon Chronicles of a Huntingdon town in 656AD. The Anglo Saxon Chronicle records the visit of Edward the Elder entering the "burgh" of Huntingdon in 921 where he 'repaired and restored' Huntingdon Castle. How do we know that Hyncel lived on this site? Why do we have no other evidence of his settlement? What evidence is there of Anglo Saxon settlement at Sutton Hoo at about the same time?